In our last part – What is the Coming Tribulation All About? Part 9 – we actually went back to Daniel 9:24-27 and discussed the specific event that was going to start the seven-year period known as the Tribulation going. That event is really two-in-one. The revealing of the Antichrist as he brokers a seven-year covenant with Israel and the surrounding Arab nations. This event, like all other events of the Tribulation occur at the precise moment God has ordained them to occur. In part 8 of this series, we said we were going to begin discussing the Seven Trumpet Judgments. We’re going to do that beginning with this article. Just prior to the release or blowing of the First Trumpet Judgment, there is silence in heaven for roughly 30 minutes. The reason is simple. Just as the lights go down and silence ensues prior to the start of a concert or theatrical production, so it is with God’s unveiling of things in His plan of redemption. All in heaven wait in anticipation of His precise movement and moment. All eyes are on Him. His will is going to be accomplished and He will not be rushed. This 30 minutes really represents the quiet before the hurricane. The first six Trumpet judgments are recorded for us initially in Revelation 8-9. More information concerning these judgments is provided in Revelation 10:1 – 11:14. 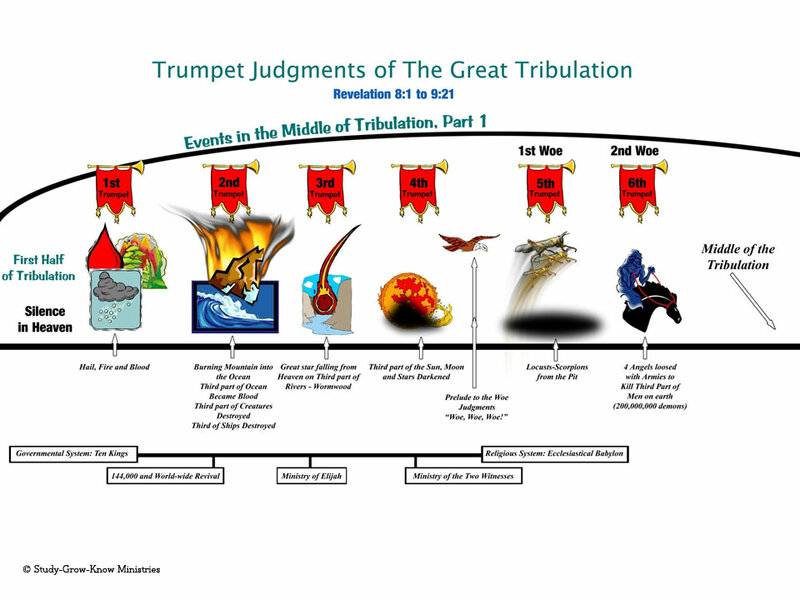 The seventh Trumpet judgment is highlighted in Revelation 11:15 – 16:21 with more specific information being revealed in Revelation 12 – 15. Trumpets have always been a very important integral part of God’s dealings with Israel and so they are here as well. In the beginning verses of chapter 8, we see an angel take the incense (representing prayers of the saints) with hot coals from the fire in his censer and flings it to earth. Once he does this, the earth is pounded with “…peals of thunder and sounds and flashes of lightning and an earthquake,” (Revelation 8:5b). The other day, we were sitting on the couch watching TV. All of a sudden, there was this tremendously loud crack or boom in the night sky. It was thunder I have never heard before and I have spent years on the east coast and am familiar with the thunder storms here. It was just a very odd-sounding peal of thunder as though a very concentrated explosion had gone off in the sky. All of us jumped up completely startled even though it had already been raining with thunder and lightning. This was very different. The angel who threw the contents of his censer to earth signified this judgment of hair, fire, and blood being thrown to the earth. Because of this, one-third of the earth was burned up, along with one-third of the trees, and all the green grass was burned up. Stop to consider this. There is no more green grass around any longer. It’s all gone as are one-third of the trees that had existed on the earth up to that point. That is quite a lot of acreage! It will have a devastating effect on humanity, not to mention animals. For all their bluster, pride, conceit, and seeming unstoppable power, the Globalists who have been attempting to bring about a one-world system (economic, religious, and social) cannot control everything. God has his say and He takes charge of many of the resources of this earth throughout the Tribulation period to prove to these elitists that they control nothing! They are powerless to keep God from doing whatever He will to His Creation and He reminds them of that fact repeatedly. The grass – by the way – likely grows again because we see it later in Revelation. But grass will easily replenish itself after forest fires, one of the first things to grow back. We do not know how much time passes between each judgment so there could be time enough for grass to grow in only a few weeks or a month’s time. The Second Trumpet Judgment occurs following the First Trumpet judgment. In this second judgment, “something like a great mountain burning with fire was thrown into the sea; and a third of the sea became blood, and a third of the creatures which were in the sea and had life, died; and a third of the ships were destroyed,” (Revelation 8:8-9). The words “something like” is John’s way of saying that while it looked like a mountain, he wasn’t sure that’s what it was at all. John could be referencing a large asteroid or meteor. To John, it looked like a mountain. The damage it causes is instant. So far, with just these two judgments, one-third of the trees are burned up, one-third of the earth destroyed, and all grass is gone. Then, one-third of the sea turns to blood (it doesn’t say “like blood”), one-third of the creatures in the sea die, and one-third of the ships on the sea are destroyed. Someone may ask – why and how are the ships destroyed? Put simply, if something large enough to look like a mountain to John falls into the ocean, wouldn’t part of the result be seen in tsunamis? Though John doesn’t mention it, it may be what he saw and would certainly explain how ships are destroyed. I think it’s safe to understand John’s meaning in a literal sense here as in most other places in Revelation. We’ll be back next time with more of the Trumpet judgments. Entry filed under: Dr. Fred, Religious - Christian - End Times, Religious - Christian - Prophecy, Religious - Christian - Theology. What is the Coming Tribulation All About? Part 9	Neato! Anti-Bullying App to Help Parents Talk with Their Kids! Another great point you made was that the globalists are not so much in control of things as they would arrogantly like to believe. Wealth makes for a lousy high tower when drought and severe storms destroys all the goods that money can buy. You can’t eat money! You raise some good questions, Sherry. Well worth thinking about.